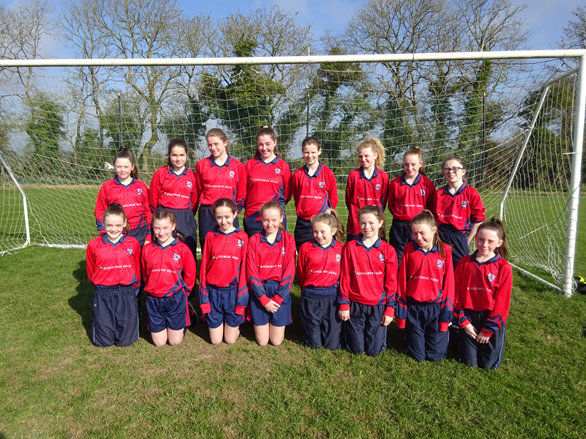 On Friday the 29th of March, the girls’ soccer teams headed to the MDL in Navan to compete against other schools. In the first match, the girls 1st team won and one of the main mids, Grace Kelly, had to leave after that match to go to the dentist. After their first match of glory, they moved onto their next match which they lost by 2 goals. After that match they went and played their third match, this winning by ten goals. After, almost like a miracle, Grace Kelly returned from actually missing her dentist appointment! Now with more hope, the girls went on and won their next match, making them through to the play off. For the play off, the girls were playing Ratoath Senior National and many girls on our team knew the girls on the other team. For the first part of the game, Ratoath were in the lead by one goal, but towards the end Molly Kearns, stormed up the pitch and took her shot, scoring a goal, making the end score, one all. The girls were made do penalties, with Molly Kearns in goal, she saved all the penalties from the other team and Molly scored a penalty as well as Grace Kelly! The girls had made history for this was the first time St. Paul’s girls’ soccer team had made it through to the finals!